Located west of Noonu, Raa Atoll is currently the home to only domestic airport in the region. 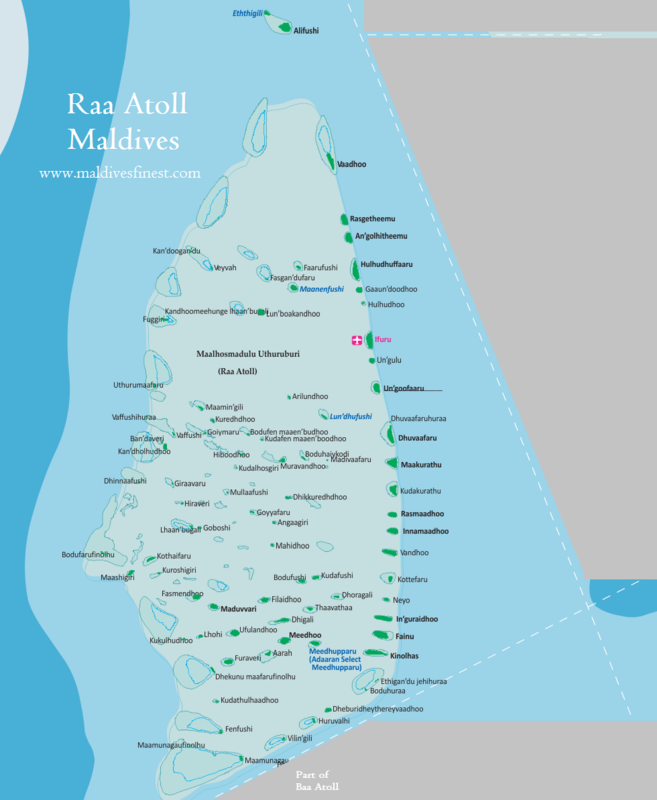 Some of the islands of Raa Atoll are very close to Baa Atoll. People of this atoll is locally well known for their boat building skills, especially the people of Alifushi. Boat yards are rare in Maldives and Alifushi is most popular that since the ancient times. Boat building is a unique skill because the people do not use drawings or blueprints but the end product is never flawed when it is done by skilled people like that of Alifushi. Domestic airport is in Ifuru island. Raa Atoll is quite relatively far from Male’ and Ibrahim Nasir Interntional Airport. But there are companies that provide scheduled speedboat transfers. It takes about 3 hours to reach Raa Atoll by sea. It is more convenient to fly to Ifuru aiport and take a boat to islands near by or even to islands in near by atolls. The scheduled speedboats take advantage of low cost as upto 18 people could fit into 1 boat. As pointed out in the map Ifuru is located at the upper tip of the atoll. Some islands of Raa Atoll are actually not that close to this airport if you take in the cost factor of hiring a private speedboat. In terms of time factor it is definitely more convenient to fly there and then take private speedboat. A downside of speedboat is choppy sea conditions if weather is not good. Outer atoll seas are usually rough unless weather is really good. So, if you are easy to get seasick the speedboat option may be last option. But speedboats are better than local dhoni boats. To travel to Raa Atoll by dhoni it takes about 10 hours. Passengers and goods go together in dhoni and there are no seats but a flat deck where you can lie down and sleep. You have to bring your own own pillow and mattress if you need one. Dhoni is the cheapest mode of transfer, not recommended for tourists. But, the adventurous tourists on budget option do travel by dhoni and stay in local guesthouses.